February Asteroid May Hit Earth Satellites! It’s hard just staying alive these-days, the Universe keeps trying to wipe us out! A newly discovered 50 metre-wide asteroid may come uncomfortably close to the Earth in February. that it might hit communications satellites. Discovered by astronomers at the LaSagra Observatory in Spain, 2012 DA14 is estimated to veer near enough to Earth to potentially disrupt geosynchronous satellites on February 15, 2013. 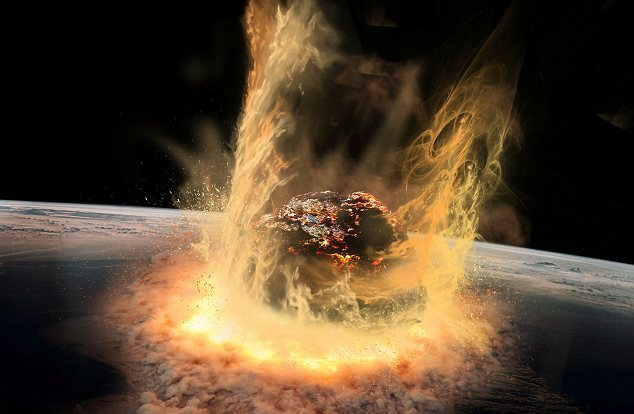 And while NASA have said the chance of the asteroid hitting Earth is 0.031 percent, if it did it would hit with the force of a 2.4 megaton explosion, similar to the mysterious Tunguska event of 1908 which leveled hundreds of square miles of Siberian forest. At the moment, the exact orbital path of the asteroid is being determined by NASA and astronomers are erring on the side of caution in case it does come in contact with a satellite. ‘That’s very unlikely, but we can’t rule it out,’ said Paul Chodas, a planetary astronomer at NASA’s Jet Propulsion Laboratory (JPL) in Pasadena California. In the preceding months to February, NASA will try to form a fuller picture of where and how close the satellite will get. ‘We don’t know exactly where it is, and that uncertainty maps through to an uncertainty in the orbit and predictions,’ said Steven Chesley, who also works at JPL. 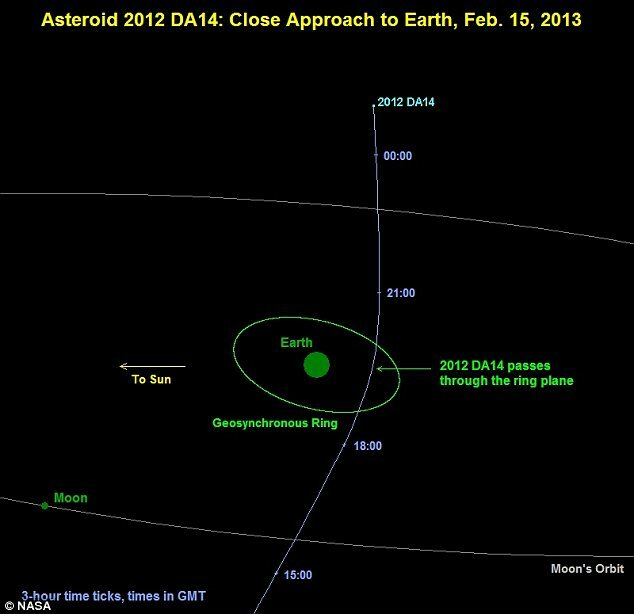 But for now, no one at NASA is worried that the asteroid will hit but say that 2012 DA14 might be visible from Earth as it flies past. ‘It might be visible to people with good binoculars or a small telescope,’ said Chodas. ‘For such a small object, that’s really unusual.’ While astronomers examine their initial estimate of a 0.031 percent chance of 2012 DA14 hitting earth, they cannot rule out the possibility of it hitting in 2020 on its next fly-pass. That is because they will have to see how close 2012 DA14 gets to Earth in February and how much our gravitational pull affects its course for its next fly by in 2020. If it does hit, scientist believe that its south-bound approach mean that it will hit Antarctica or the Southern Ocean. The detonation of the 140,000 ton rock would not end civilization but would potentially cause massive loss of life if it hit a populated centre. 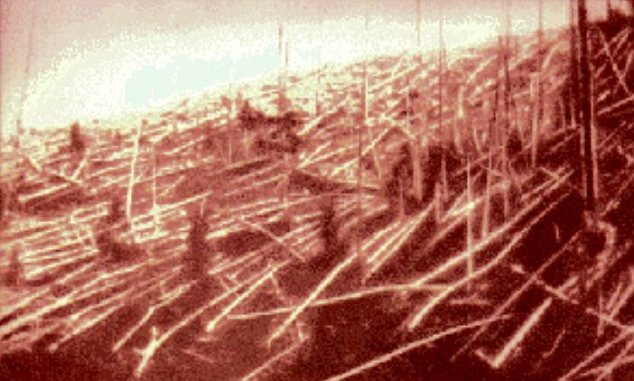 In 1908 it is believed that a comet of an asteroid exploded in the skies above Tunguska in Siberia, causing trees for hundreds of square miles to flatten horizontally. Of the several hundred thousand asteroids known, about 9,000 are of the near-Earth variety, and of these more than 1,300 fall into the category known as potentially hazardous asteroids (PHAs). To qualify as a PHA, an asteroid must be able to come closer to the Earth than 7.5 million kilometers in its orbit and be larger than 100 to 150 meters in diameter. An asteroid of this size, if it impacted in a sensitive area, could cause significant regional devastation, laying waste to a major city or even an entire state. Unless steps are taken to do something about it, the Earth will be hit hard again in the future. Collisions such as the one that happened 65 million years ago, involving an asteroid roughly 10 kilometers across which slammed into what is now Mexico’s Yucatan Peninsula and contributed to a mass extinction, are extremely rare. However, smaller but still potentially devastating impacts happen much more often. As recently as 1908 an object roughly 50 meters across—either an asteroid or part of a comet nucleus—exploded high above the Tunguska region of Siberia, flattening 80 million trees radially outward from the epicenter of the blast. A similar encounter over a highly populated area would cause massive disruption and loss of life. Our knowledge of the numbers, sizes, and orbits of PHAs has increased dramatically over the past decade or so thanks to a number of dedicated observing programs, such as the Lincoln Near-Earth Asteroid Research (LINEAR) project and Catalina Sky Survey. The results of the most recent survey of near-Earth objects (NEOs), which includes both comets and asteroids, carried out using NASA’s Wide-Field Infrared Explorer (WISE), suggests that 20 to 30 percent of all PHAs have now been found. No known asteroids pose an immediate threat to our well-being. Astronomers have devised two different scales to categorize the impact hazard posed by PHAs; the simpler of these, called the Torino Scale, assigns a number from 0 (no threat at all) to 10 (certain impact large enough to threaten the future of civilization) to each body. At present, only two PHAs have a non-zero rating, and both these have a rank of only 1. The highest Torino ranking an asteroid has ever earned was 4 in the case of Apophis, but this was later revised to 0 in the light or more accurate orbit calculations. Still, there are reasons to be concerned. If a sizeable space rock—say half a kilometer across—were found to be on a direct heading for Earth, with only a couple of decades before impact, what could be done about it? There are two main possibilities: destroy or divert. Blowing up an asteroid, say with nuclear weapons, isn’t necessarily a smart idea. A shield to protect Earth from possible asteroid impact is a measure important for the foreseeable future many scientists announced at the last meeting of United Nations officials in Vienna, quoted by British newspaper The Telegraph. An international network must be designed to explore outer space and to detect potentially dangerous asteroids on Earth. The same network will be responsible for organizing a fleet of spacecraft that can destroy or deviate from their path, celestial bodies at risk to collide with Earth. Even if the danger of a collision with a giant asteroid is quite low, a possible impact would be devastating, said astronomers meeting in Vienna. It is assumed that the last asteroid hit the planet was 65 million years ago, which led to the disappearance of 70% of life forms existing at that time. Also, the impact of the Tunguska region of Siberia, which took place in 1908, presumably due to a massive object from outer space.Calculations show that risks are reduced as much as previously thought. The chances of an asteroid with a diameter of over 45 meters to enter Earth’s atmosphere are 2-1000 years. ”The international community should endeavor to expedite such a decision. It needs to consider three important aspects regarding future organization: warning of danger, destruction or diversion technology to gigantic celestial bodies, decision-making process must be fast, “said Lord Rees, president of the International Panel on Asteroid Threat Mitigation. According to the researchers expectations, by 2020 we should be capable of detecting at least 500,000 asteroids orbiting the solar space. Of these, several dozen presents a real threat to Earth.